Welcome everyone to a series on some of the more advanced features in Clearview Social, aptly titled Clearview Deep Dive! This is Eric Adams, Lead Engineer for Clearview Social, and I'm here today to walk you through Referral Tracking. Why would I use Referral Tracking? How can I tell if sharing brings in new leads? How can I tell who is bringing in the most new business? Can our website track whose shares are being clicked? When you want to internally track the success of your organization in generating leads and business through Clearview Social, Referral Tracking is the feature that will meet your needs. So let's dive in! 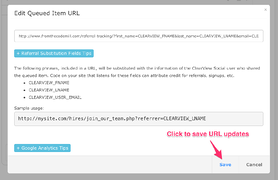 Once you are done editing the URL, click "Save" to update the queued item with the new URL. Once you have updated the Queue items you would like to track, you can send the Queue out as you normally would. No additional steps are required in Clearview Social! Where do I see the referral fields? Once the Queues are sent out, each user's unique link will contain their first name, last name, or email address (depending on how you modified the URL). When they schedule a Share, any clicks on that Share will redirect to a URL that includes the original sharer's info. How can I test this out? If you have a Clearview Social admin account, you can try out Referral Tracking using this demo. In this demo, we simply add the fields from the URL to display on the page. That is just the tip of the iceberg of tracking possibilities using Referral Tracking. We will also have blogs and demos in the near future of both Conversion Tracking and Tagging & Tracking, so stay tuned!